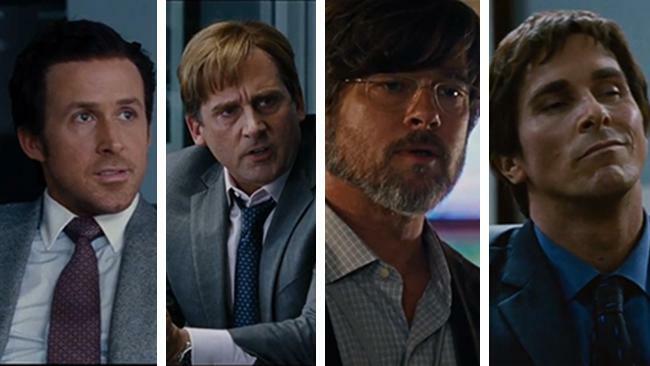 The Big Short (2015) – Movie Review – Another Movie Blog! If you were confused as to why The Other Guys ended with a politically loaded animated sequence making you wonder if you had been watching the wrong movie the whole time, well fear no more, because Adam McKay has gone and extended that into a full length feature. Adapting Michael Lewis’ novel, The Big Short is a comedy-drama plays as both narrative and education, an attempt to dramatically depict the events of 07-08 financial crisis and also explain how we even got to that point. This story/lesson is told through the eyes of four different, semi-interlocking stories about those rare few who saw it coming beforehand, and who realised they could make lots of money by betting against the system, and all the tragedy its collapse would entail. On paper that could sound boring, and indeed the movie points out how these events were made seemingly boring and complicated so people wouldn’t pay attention to the corruption going on. McKay recognises the inaccessibility, and along with the explorations going on in the narrative uses plenty of forth wall breaks, cutaways and Cinéma vérité cinematography to remind us we are watching a constructive narrative, and occasionally segueing into celebrity cameos explaining the concepts at play. The intended result of those sequences will depend on how much you already knew about the subject matter at hand, but I should say I came out of this knowing a lot more about the business of CDOs then I did going in. But there are moments with the forth wall breaking that, although entertaining, neither coalesce with the movie or provide a suitably funny break from what is going on. When Ryan Gosling’s character pitches his schemes in a funny segment using Jenga blocks, you kind of wonder if the celebrity cameos were even needed. There is definitely of element of self-depreciation to that, like McKay company know they are following the morally corrupt, patronising characters and are playing around as such, but in the eagerness to impart information sometimes the director/character voice gets muddled. There are obvious comparisons to be made on the morality front with the Wolf of Wall Street, particularly with characterisation of Jared Vennett (played in slimy, insecure style of Ryan Gosling), as well as the numerous dudebros in the banking system and a couple of actors that appear in the film. In fact, at points it appears to address the criticisms of Wolf of Wolf Street upon its release, being the lack of the victims’ point of view, the brushing aside of explanations, the non-sympathetic characters and the lack of overt condemnation (because Scorsese had other things on his mind). The Big Short finds its unique voice in hitting these points, touching upon those who lost their houses in the fallout, and being full of righteous anger as a result. The end credits alone will leave wanting to go outside and set the nearest cash machine on fire. But this also demonstrates how much of a streamlined bullet Scorsese’s film was in cutting all that stuff out. For one example: I think this is the best performance Steve Carell has given; I was never completely taken in by his make-up laden work in Foxcatcher, and here he is able to ride that line between comedy and drama in a way that feels really natural. But attempts to give his character a tragic, sympathetic backstory is pretty laughable, and does nothing but distract from the actual story at hand (and also waste Melissa Leo!). Brad Pitt’s character has short screen time, but his disheveled Ben Rickert provides a good counterpoint to the actions of the suit wearers around him. Like other films he helped finance, such 12 Years a Slave and The Counselor, he mainly seems there to provide a monologue detailing the moral throughline of the film. Christian Bale as Michael Burry is the only one of the main cast to be nominated for an Oscar, and this is particularly odd because he never interacts with anyone else in that main line-up. Like the character himself he is secluded, and through those isolation and eccentricities, ranging from his glass eye and low level Aspergers to his obsession with Heavy Metal, he is able to spot what no one else in the system could (not sure how the Heavy Metal helped though). The Big Short is not the best film of the Best Picture nominees, but it might be the one I encourage the most people to see. In terms of laying out the environment that led to the financial collapse it is more successful than counterparts like Margin Call (still an enjoyable film). It’s direction – particularly the montages – can distract from the issue at hand, and in the end I probably like more what this film is than how this film is. But the how is still very entertaining.